This study is especially interesting as it retains some of the original pencil sketch for one figure and it is possible to see adjustments made by the artist as he painted. 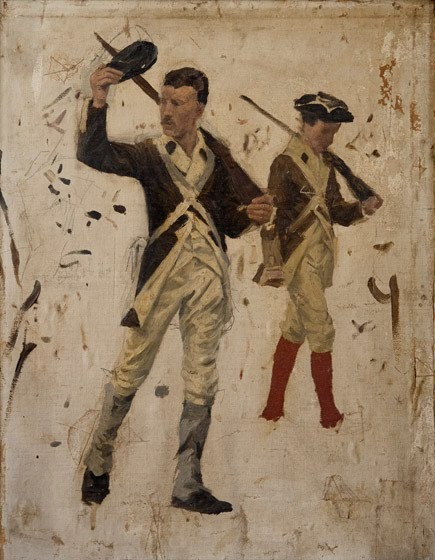 The larger figure is a study for the young soldier saluting Washington in The March to Valley Forge. It is possible that the face on this saluting soldier is that of the artist himself, though it is only a very simple sketch. The sketch was obtained from the estate of the artist by his pupil and protégé, Walter E. Baum. It passed to Baum’s son, Robert “Bert” Baum, who sold it to the mother of the current owner in 1963. Bert Baum removed the sketch from its original stretchers and mounted it on artists board. The lines where the canvas wrapped around the stretchers are still visible. The sketch is in good condition, though it might benefit from a cleaning.